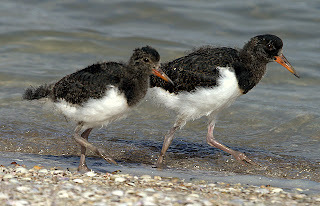 I've watched the progress of two Pied Oystercatcher chicks over the past few months as they've grown. 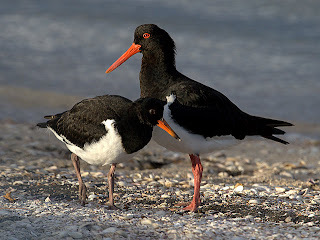 They are the progeny of a pair of POs that nest close by the oyster sheds at Pipeclay Lagoon. 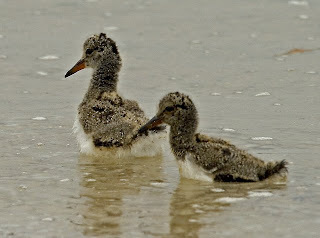 Their first attempt was most probably washed out, as they nested on a shingle bank close to the high tide line. 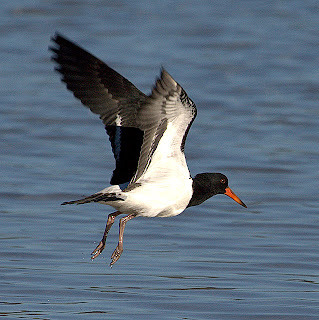 This is a familiar fate for many oystercatcher nests, and with global warming bearing down on us, this is a potentially serious threat. I never found these chicks at the newly hatched stage, a nd I'm guessing that the age of the two at top right, is about a couple of weeks. The shot taken around the third week of January. As you can see, they're both in the water, and the high tide strategy against predators, is to swim away. PO young are accomplished divers too, and will dive, as a last resort, when hotly pursued. The shot of the 2 youngsters running, was taken on the 8th February, and by now there is a marked difference in their size. Less than 2 weeks later, towards the end of February, one runner had disappeared, and I can only speculate on the cause. Given the size difference, perhaps it was food related, but predation from a range of likely suspects, ranging from harriers to gulls is possible, as is the possibility they were taken by cats or dogs. The latter a real possibility, as I've seen dogs being exercised off lead, along this very narrow stretch of beach. 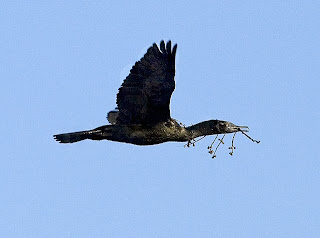 By the end of the first week of March, when the shot of the remaining chick with one of its parents was taken, the chick is approaching fledging, but still dependent on its parents for food. This juvenile was soliciting the adult for food, constantly walking round and round its parent. 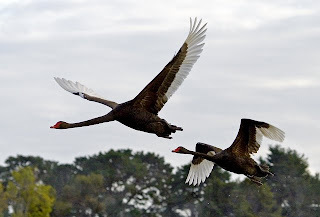 Occasionally it would flex its wings, and the primaries were clearly not fully developed for flight. By the 18th of March, success, it could finally fly! Rather hesitantly, and somewhat reluctantly, but it could fly. So after around 8 weeks it had made it, but its still dependent on a parent to feed it. I'll continue to keep an eye on its progress. Mid week, I had this sudden urge to spend some time birding a buttongrass plain. Having spent many hours walking them, in all weathers, and generally finding them close to a birding desert, I'm not quite sure why I had this urge! 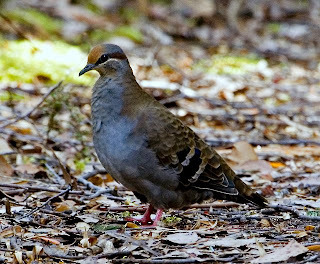 (I took part in a fortnight's scientific survey in a similar area, in the SW of Tasmania, in which we only recorded 24 species of birds in a fortnight). I chose to drive out to the Scott's Peak Road, some 30 kilometres West of Maydena, and an area that has numerous, extensive areas of buttongrass. Buttongrass is a sedge that grows on some of the most nutrient poor soils found anywhere. The 'buttons" are the seed heads produced at the top of stems. 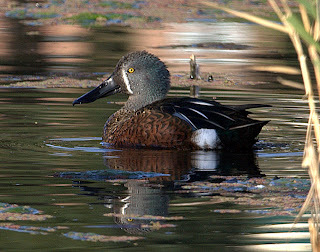 They are widespread in many poorly drained areas of Tasmania. Turning off the Gordon Road at Frodsham's Pass and on to the Scott's Peak Road, I eventually stopped at a spot between and below, Mt. Bowes and Mt. Anne. It had potential, I thought, with a line of stunted and flowering Banksia marginata al ong one side of the road, and a buttongrass plain that had been burnt, probably around 12 months ago, the sedge having recovered, on the other. The temperature was still fairly cool, below 10C, and there was a heavy mist hanging over the whole valley, but it appeared to be burning off rapidly. As soon as I got out of my car, I could hear and see that I appeared to have chosen the spot well. 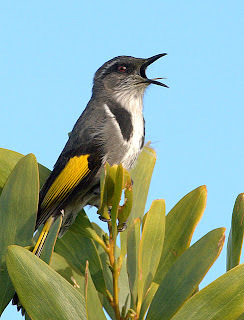 In quick succession, I spotted Crescent and New Holland Honeyeaters in abundance, many off them obviously this season's crop, most of them noisily chasing one another. I noted a young Pink Robin (way out of its usual habitat), several Dusky Robins, and a couple of Striated Fieldwrens. 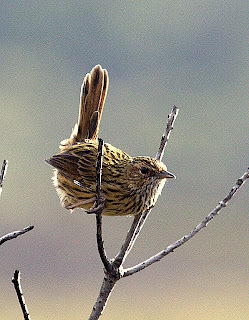 Buttongrass plains are to my mind, the habitat for Striated Fieldwrens . 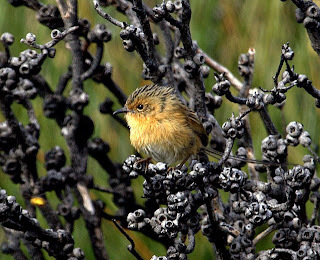 In the Spring, you can often find them in abundance, calling from the tops of the sedges, especially early in the morning, and again in the evening. Well I always take any opportunity that presents itself to photograph these elusive birds, so I set off in pursuit, so to speak. They took the opportunity to cross the road and take refuge in the burnt stunted banksias, so I followed. Well actually I would like to have followed, but I was confronted with a 3 metre deep ditch, which I thought I coul d jump, but decided to look for an easier access point. After much searching, I found a spot and soon found a 'heap' of fieldwrens, many of them running between the tussocks, giving no real chance of photography. As you can see (top left) a single bird took pity on me long enough to get a shot or two. 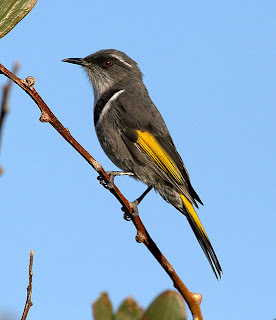 There followed a procession of birds that used the skeletal remains of banksia, teatree and hakea shrubs, as a vantage point to catch flying insects. 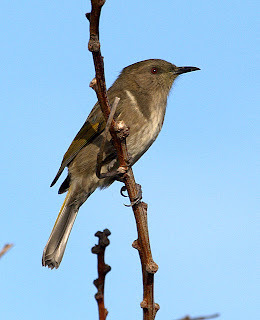 The female Crescent Honeyeater (pictured top right), alighted close enough for this 'full frame' shot, finally catching a small moth almost off my shoelaces! It was only a few minutes after that encounter that I noticed an orange 'blob', standing out against the burnt teatree some 50 metres away. It was one of those moments that stay in your mind, a quick look through the binoculars, yes! 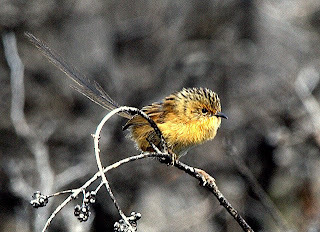 it was a Southern Emu-wren, a bird that you often hope to see in these situations, but seldom do. 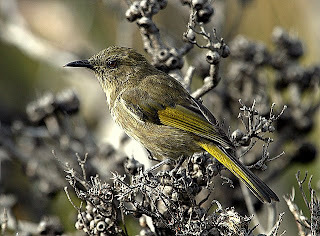 One of the iconic birds of Tassie's more remote areas. I've seen a good number over the years, and I don't think they're that uncommon in the South West, but they are very elusive, as I was about to find out. I stalked 'them', it transpired that there were 4 or 5 individuals, for sometime, trying to get close enough for a meaningful photograph, and took several record shots as I did. The two images shown here (lower right and left) are all I managed, and that they're even recognisable owes more to the benifits of digital photography, than any skill on my part! Eventually they just disappeared, and although I was quite confident which small piece of scrub they were hiding in, no amount of 'coaxing' drew them out. I guess I'll be revisiting this spot. After all the excitement and concentration, I retraced my steps to the car, realising as I did, that I was heavily covered in charcoal streak marks from the burnt scrub, but thinking that it was a small price to pay for an engaging morning. Yesterday, the first half decent day for sometime, saw me heading off for the Wielangta Forest. The weather lately, while not producing much rain, has been blustery and cold--I have to admit to having turned the heater on a couple of times last week, a first for any Tasmanian February that I can recall! I followed my usual routine, a stop at the picnic area, and then on to the Northern end of the Sandspit River track. This area is fast becoming one of my all time favourites, only soured slightly by being an hour's drive from home. The stop at the picnic area produced the usual Pink Robin (top left), and I could hear it calling as I opened the car door. I spent 20 minutes or so here, waiting for an opportunity to get a shot and it graciously allowed me to take a few images. 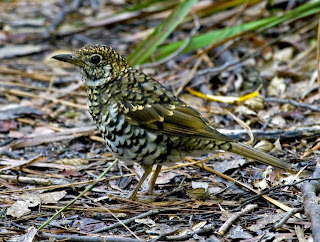 While I waited, I watched several passing Tasmanian Thornbills gleaning insects from the underside of leaves, and listened to the calling Strongbilled Honeyeaters high overhead in the towering eucalypts. Having snared my shots of the r obin, it was time to take the short drive to the Northern end of the track. 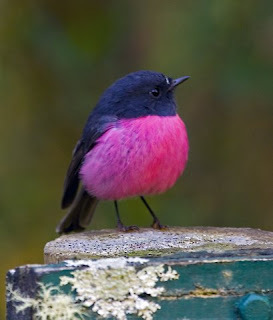 Another Pink Robin greeted me as I parked, which I took as a good omen. It was still fairly cool, but very still, with warmer air from the sunlit patches, wafting over me as I walked. Little stirred over the next 3 or 4 hundred metres, except small groups of Bennett's and Rufous Wallaby scuttling off through the scrub, and the local Kookaburras putting on a noisy show. I moved quickly, deeper into the forested areas. 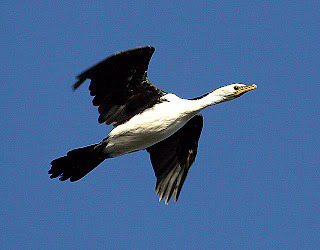 culminating in one that allowed sufficiently close approach for some shots. In fact the individual pictured, instead of scurrying off into the scrub, actually chose to run toward me for a closer inspection (obviously a bird with taste!). With increasing cloud cover, and with a forecast of rain, I thought it prudent to retrace my steps to the car. It had been a great morning, and I had managed a few shots of species that are among the more difficult to photograph. The amount of light penetrating the forest here is low, and all the shots were taken at speeds of less than 1/50th of a second, with a telephoto lens. Those with photographic knowledge will know that is 'pushing your luck' and indeed many of the shots suffered accordingly, but I got away with the few shown here. A recommended walk on suitable days.